The unique look of the half-diamond heart necklace in 14K white gold from Apples of Gold Jewelry is sure to be a hit, whether given as a gift or purchased for yourself. 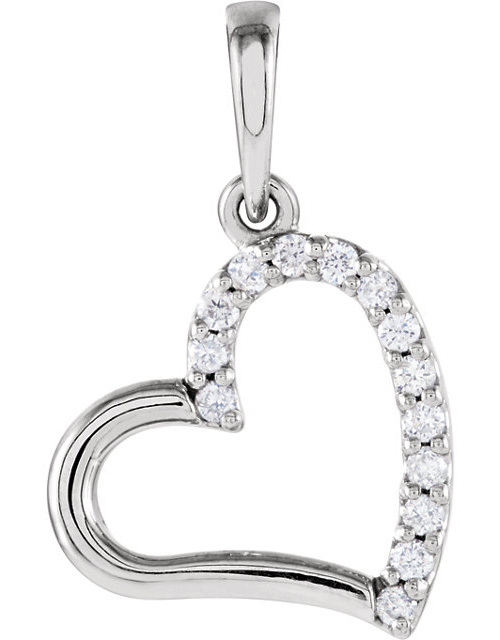 The dangling heart pendant measures 3/4 inch tall by 1/2 inch wide, and has one half plain and polished, and the other side of the heart is decorated with fourteen diamonds to add extra accent and beauty. The diamonds are rated G-H for color and I1 for clarity, and total 0.07 carats total weight. This unique and beautiful look is both fun and romantic. We guarantee our Half-Diamond Heart Necklace, 14K White Gold to be high quality, authentic jewelry, as described above.